Months ago I got a somewhat “junk mail”-looking thing from LEAP (Local Energy Alliance Program), a non-profit home energy resource that “works with local government and utilities to help homeowners lower their bills and save money”. They promised a $250 rebate on a home energy audit that could potentially result in lower energy bills, so I figured I’d give it a shot since the out-of-pocket cost was minimal (I paid about $150 out-of-pocket because I got an additional “blower-door” test). That’s how I got introduced to the fine folks at Home Performance Solutions, who conducted the Home Energy Audit. It was incredibly informative, and for those of you living in the Northern VA area, they come highly recommended – not just for the audit itself, but the high-quality improvements they did later. If you live elsewhere, you should be able to find a similar service with a quick Google search. The process was quite comprehensive. My consultant Marty walked me through the entire house from basement to attic and identified problem areas where energy was being wasted. 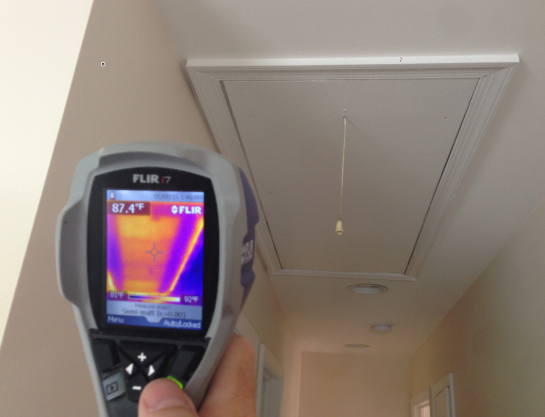 He then used a thermal imaging camera to identify poorly insulated areas, and performed a “blower door test” which involved connecting a fan to the front door to see how much air is leaking through various gaps in the house. This test produced real numbers that we were able to use to quantify additional improvements done later. Lower the thermostat on your hot water heater. 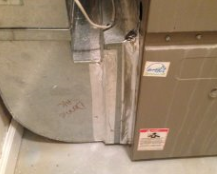 Some water heaters actually have two thermostats, and they may be behind screwed-on panels and insulation like mine. Interestingly, my top thermostat was set at 150 and bottom at 130 – but after adjusting both to 125 degrees, I haven’t noticed a difference at all in water temperature – and am no doubt saving energy with this tiny change. Finally, for other home energy tips and tricks, check out the Home Energy Pros web site.